From fierce big cats to herbivorous ungulates, several species face grave threats in the arid expanses of Niger. 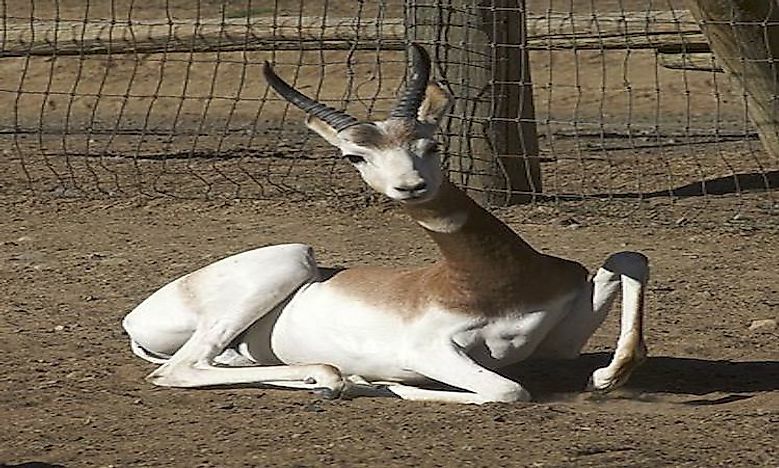 The dama gazelle is a native species of Niger. Niger, officially the Republic of Niger, is a landlocked country in West Africa bordering Chad, Libya, Nigeria, Benin, Burkina Faso, and Algeria. It is the largest country in West Africa with an area of 489,678 square miles and a general population of 17.2 million. The state’s 80% land area is part of the Sahara Desert, but the non-desert area faces significant threat due to desertification and drought. The Addax, also known as the white or screw horn antelope, is scientifically known as Addax nasomaculatus. It is found in the Sahara desert and was described by 1816. It is sexually dimorphic animals where the females are smaller than the males regarding body size and length. It mainly feeds on grasses, leaves of shrubs, leguminous herbs, and bushes and is adapted to live in their desert habitat as they can live without water for long periods. They walk in herds of approximately 20 individuals and due to their slow movements they are an easy target for predators like humans, lions, cheetahs, leopards, and other carnivorous animals. It is mainly found in the arid region and semi-deserts and breed during winter and early spring. The Addax has been listed as a critically endangered species due to unregulated hunting in their habitats. The West African Lion, scientifically known as Panthera Leo senegalensis, is a subspecies of lions from the family of Felidae. It is smaller than lions from Southern Africa in body size and shape. It lives in smaller groups than other lion species and is mainly found south of Sahara desert from Senegal all the way to the Central African Republic. . The West African giraffe, scientifically known as Giraffa Camelopardalis Peralta, is a subspecies of the Northern giraffe from the family of Giraffidae located in the Sahel regions, West Africa. This subspecies of giraffes mainly rely on the seasonal migration between the drought-resistant lowlands of Niger River valley and the dry highlands near Koure. Its diet is composed of main leaves of plants in the regions. The dama gazelle is a species of gazelle from the family of Bovidae scientifically known as Gazella dama. This species of gazelles is divide into three sub-species, the N. dama, N. dama mhorr, and N. dama ruficollis. It is mainly found in the Sahara desert and Sahel regions in the grassland, shrubland, open savannah, and mountainous plateaus. Its diet is mainly composed of grasses, leaves, shoots, and fruits. West African Lion has been on the constant decline, and some have been captured and kept in zoos to prevent their extinction. Intensive efforts to save the West African Giraffe been put in place to ensure the sustainability of the species since the 1990s; the increase has been witnessed over the years.The Dama Gazelle has been listed as a critically endangered species due to excessive hunting and habitat loss because of the ever changing weather and climate.